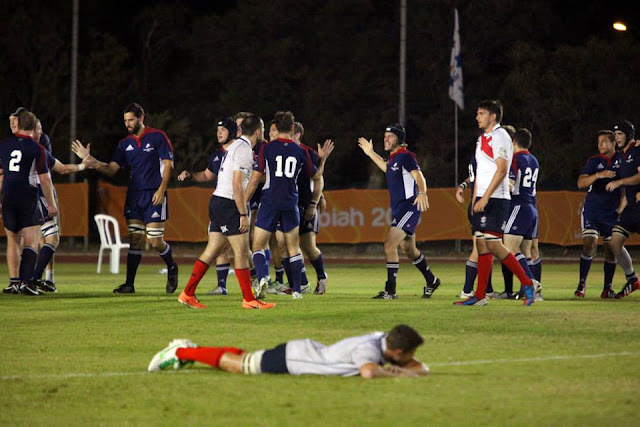 After winning the rugby sevens tournament last week, the U.S. rugby team for the Maccabiah also won the bronze medal in the rugby 15s tournament after beating Great Britain 15-3 in the game for third place. With this win, the U.S. once again retained its status as the only team to win a medal in each rugby tournament in the history of the games. Head Coach Shawn Lipmam, who previously won medals as a player in five Maccabiah tournaments, broke the record for medals in Maccabiah open category tournaments, as he has seven now. We built a remarkable team that arrived in Israel as the fittest and strongest we have ever assembled. Even though we had trained individually nothing can compare with playing together as a team and getting consistency in execution under pressure. We think we were good enough to have beaten Australia to make the final, but retain lapses on execution hurt us. The game we played against Great Britain for bronze was amazing and an excellent way for us to end. Israel deserved to win the fifteens tournament, and I think it is a good thing for the tournament that more countries are doing well as the competition is becoming more broad based. It was a great accomplishment to have won the gold in sevens, as Israel keeps playing international sevens all the time, and we had only two sevens training sessions. We also had to come back from having lost to Israel and tying South Africa prior to the sevens tournament final game. We showed tremendous heart and courage. Throughout the games, the team suffered with the absence of the injured Zach Test. The 23-year-old is already the U.S. sevens team’s leading try scorer among active players, with 73. More important than winning medals is the fact that this tour changed our players’ lives in very deep and meaningful ways. Every participant in our team is leaving as part of a band of brothers, and now has a family that will always be there with him for the rest of his life. That is the real gold! It was harder than one might have expected, but the U.S. has won its first gold medal of the 19th Maccabiah games yesterday (Wednesday), after defeating Israel 17-14 in the final of the rugby sevens tournament. The rugby 15s tournament will start tomorrow, but the team will hold its first match of it on Sunday, against Canada (10 a.m. EST, Wingate Institute). Tries by Willie Rudman, Team Captain Dallen Stanford (tournament MVP) and Joel Cohen (5 points each), and one successful conversion kick for Standford’s try by Taylor Howden (2 points), provided the team with a promising 17-7 lead. Israel rallied back with a successfully converted try, but the U.S. managed to hold its opponent from scoring any more points. On its way to the final, the team had lost the lead in two of its three round-robin stage matches: On its first match, South Africa came back to a 12-12 draw against it after trailing 12-0. On its second match, Israel upset the score, from a 5-0 trailing to a 5-10 win. However, on its last round robin match, the U.S. thrashed Great Britain 35-0 to finish the stage second, after Israel, and win the ticket to the final match against it. The greatest success story of the tournament, according to Lipman, was Jarett Brotz of Cherry Hill, N.J. After the trials for the team last January, the back-row forward was put on the reserve list. “We saw potential in him, but he needed to work on his fitness,” explained the Coach. As previously-qualified players could not eventually join the trip, Brotz was called to fill in. During the training in Israel, he was chosen as one of the 12 players out of 29 to participate in the seven-a-side tournament. As the tournament progressed he earned increasing playing time, and shined on the defensive side. “He will be one of our most important players in the 15s tournament,” concluded Lipman. The opening ceremony for the Games will be held today in Jerusalem (1:30 p.m. EST, Teddy Stadium), with almost 9,000 athletes participating and 30,000 expected viewers. Many of the tournaments will start tomorrow (Friday). The opening ceremony of the 19th Maccabiah Games will be held next Thursday, but one American team wants to be wearing gold medals for it. 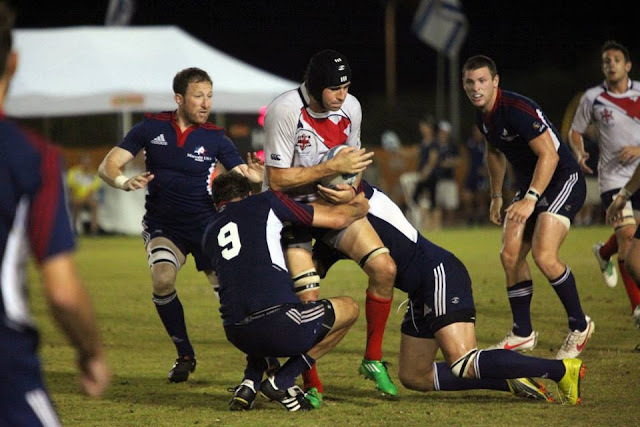 One of the earliest tournaments of the games will be of rugby sevens, with the U.S. team taking on South Africa, Israel and Great Britain tomorrow (Wednesday) in the Wingate Institute, Netanya. On Friday, the four teams will be joined by Australia, Canada and Chile for an 11-day rugby 15s tournament. Due to the weather conditions and the high intensity of the 14-minute long sevens game, the tournament will start at 17:20 Israel time, and the final game will be played as late as 22:20. The teams will have to finish the round-robin stage in one of the top two places in order to win a ticket to the final. The Philadelphia area will be represented in the team by Jarett Brotz from Cherry Hill, N.J.